4 – 7:30pm Vision Board Party Edmonds! It’s All About the Details! In order to BE, DO or GET what you WANT, your Desires must be CRYSTAL CLEAR! Vision Boards show the way! Join us and create your own Vision Board, share yummy food, have lots of FUN and BONUS! create new Friendships! Why Make A Vision Board In 2019? 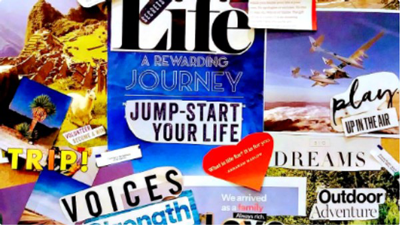 A vision board is a collage representing things you would like to attract into your life. Pictures, quotes and phrases out of magazines, and print images from websites, as well as your own photos, may be included in the collage. Glue the images and words onto a piece of poster board and then place it somewhere you can see it daily. This Party is to Shine LIGHT on the Thoughts that you have; to turn them into Plans to Put into Action and remind yourself to Live in that Moment. Every day. Pre-registration required. To reserve your spot, click HERE.